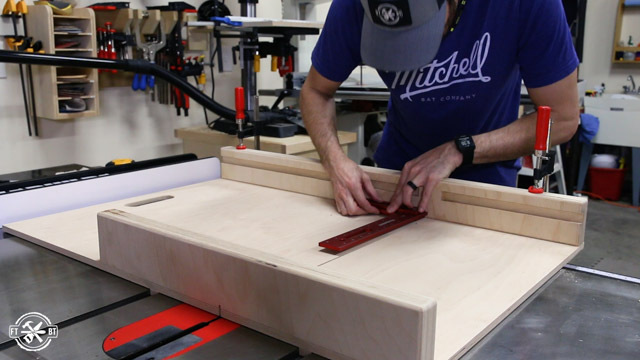 Today I’m going to show you how to make a table saw sled for your shop. 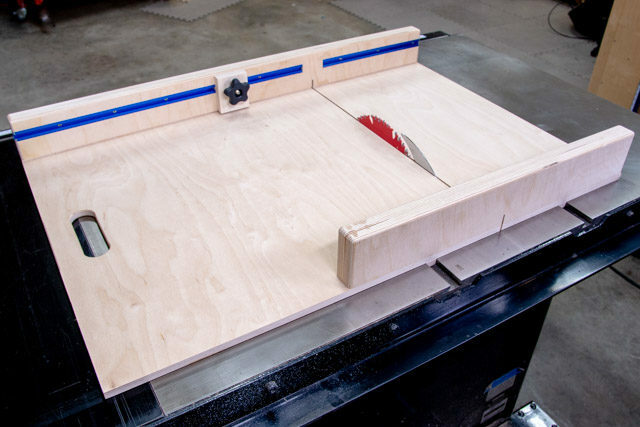 In my opinion a crosscut sled is a must have jig for the table saw. 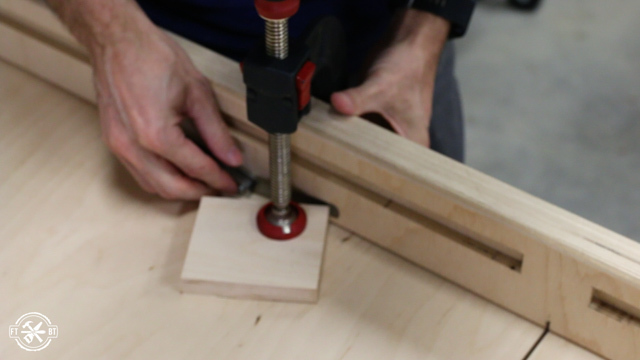 Paired with a stop block it lets you make repeated cuts with ease. 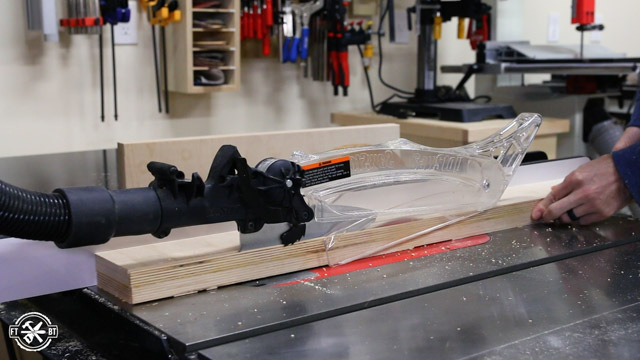 And the cuts are clean thanks to a zero clearance slot matched with your blade. 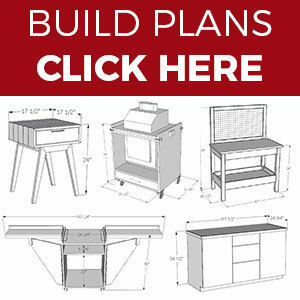 I’ll show you how I made mine, and you can make one too with the free plans. My old DIY table saw sled served me well for years but it’s worn out now. So today I’m making a nicer version with a simple design. 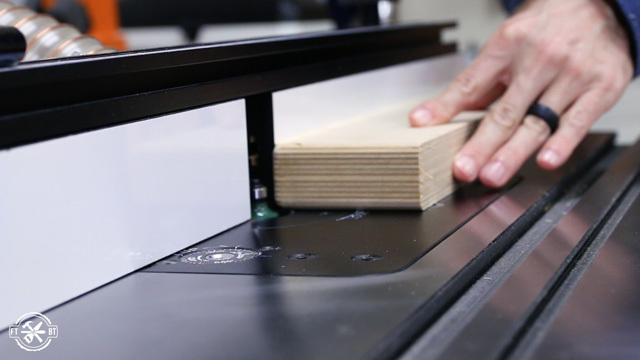 Be sure to get the Free Plans so you can make your own table saw sled today! 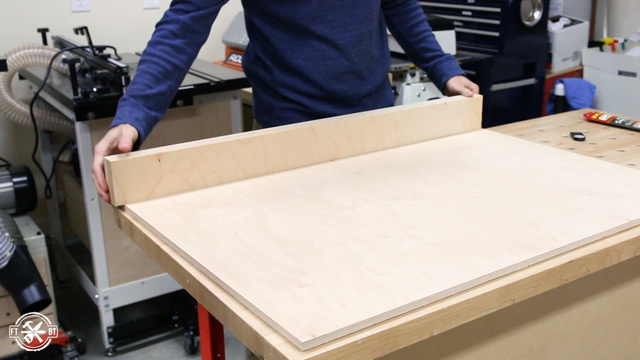 I grabbed a large piece of ½” plywood and cut it down to 36 inches wide and 24 inches deep for the table saw sled base. This is a bit larger than my old one for a little more capacity. 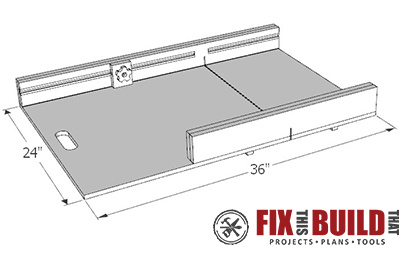 The half inch ply will keep the crosscut sled weight down. But for the fences I’ll use double stacks of ¾” ply. I had a five foot offcut about 9” wide that I ripped down to two 3.5” strips. Next I cut both strips at 37” which is for the back fence. This left me with two strips at about 23” for the front fence. You could make the front fence full width but it just adds extra weight. 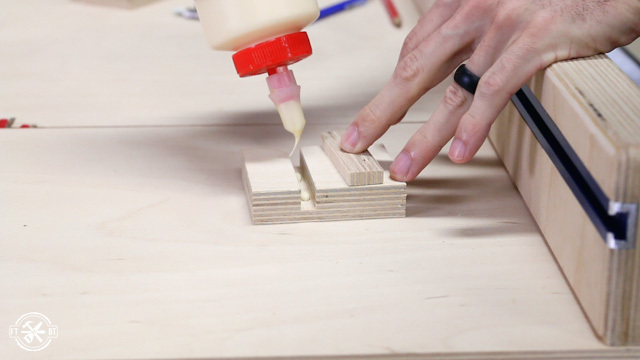 Gluing the plywood together makes a really beefy fence, but you also want it as straight as possible. 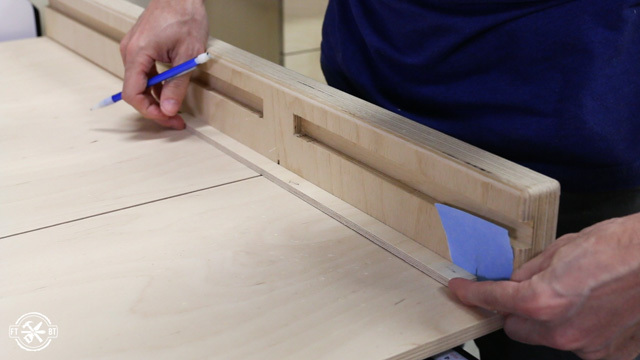 You can counteract any bow in the boards by flipping them in towards each other for the glue up. I let the boards dry over night then took them out of the clamps the next day. After that I flattened one side of each fence on my jointer then cleaned up the opposite face on the table saw. 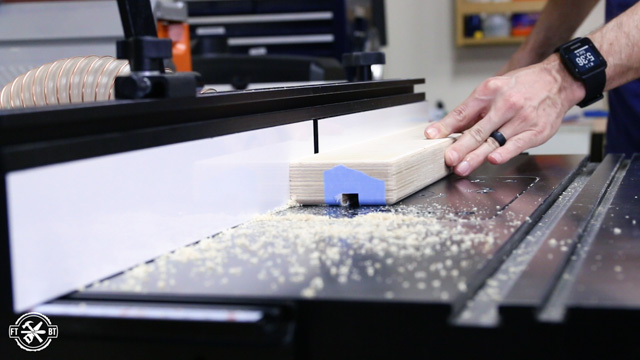 You can clean up both faces on the table saw if you don’t have a jointer. Next I cut one end of the long back fence square. 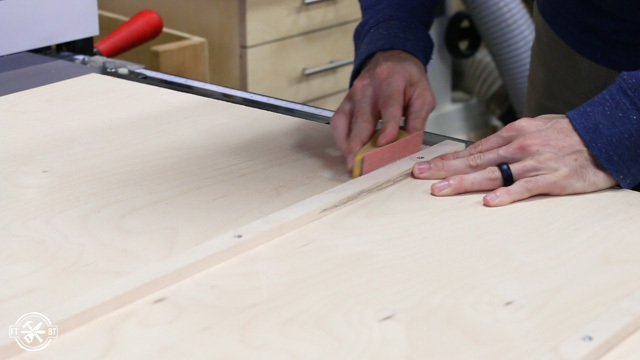 Then marked for the other cut using the table saw sled base. The length of the short fence doesn’t matter so I cut each end square. Then I put a round over on all the exposed edges. 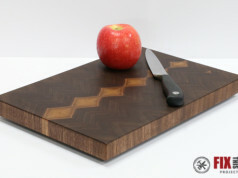 To make the runners I used a small piece of maple and some plywood offcuts. 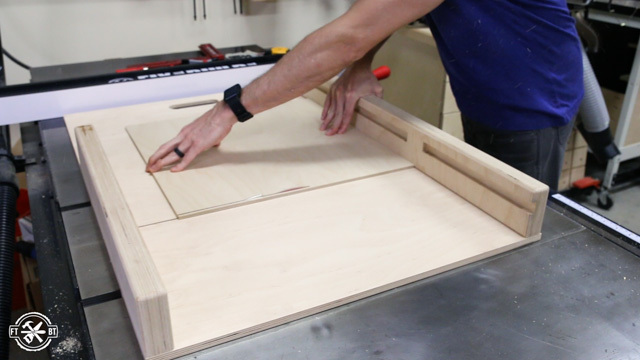 I used the plywood for a few test cuts and dialed in the sizing. 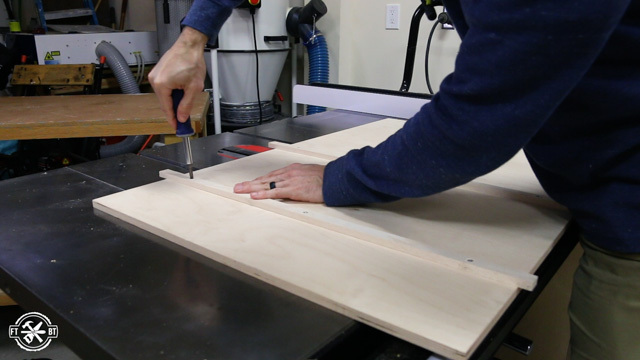 Then I ran the maple board through to cut my runners to width. After that I adjusted the fence to ⅜”, flipped the runners on edge and ran them through. 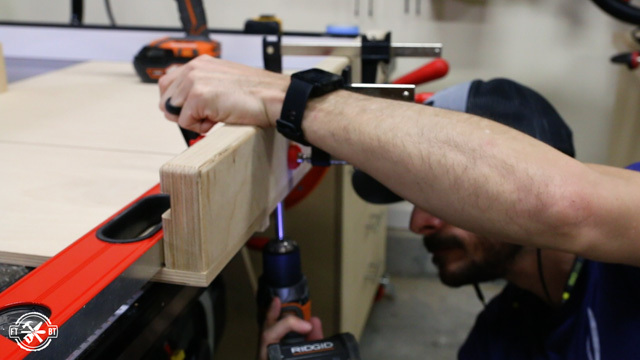 I took the runners to the table saw sled base and drilled three countersunk holes in each one. 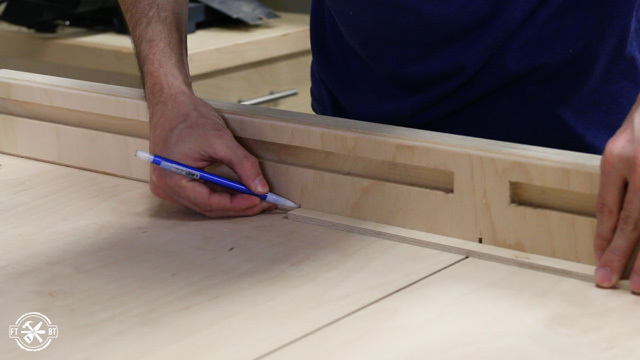 Next I used the miter slots to position the runners. I put stacks of two washers along the slots. Then I dropped in the runners to raise them above the table surface. I set my fence at 24.” This will give me 2 feet to the right of the blade and 1 foot to the left for my crosscut sled. Then I put a few dabs of super glue on the runners and put the base on top with some weight to let it set. 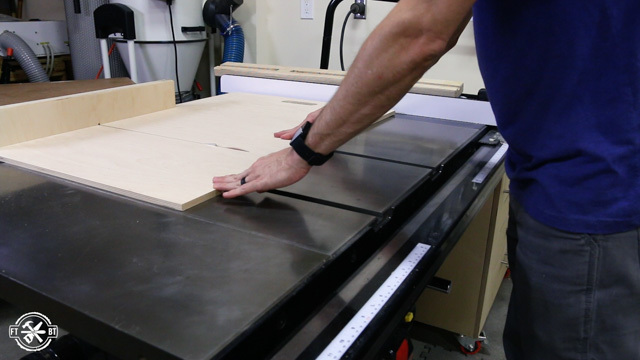 After a couple minutes I flipped the crosscut sled over. Then secured the runners permanently with #6 ⅝” screws. I cut the runners to length on the base. 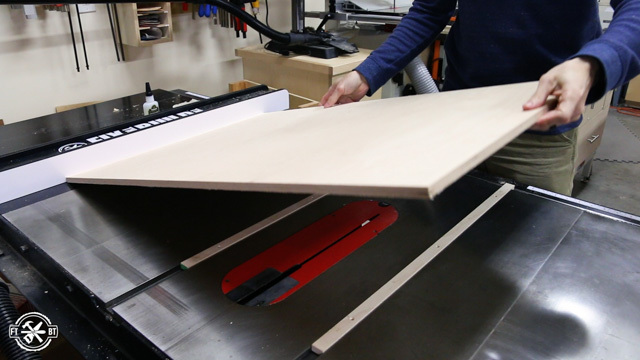 Then I gave the table saw sled a test run. It was a little sticky in spots so I used a tip from the Wood Whisperer to fix it. I put pencil marks on the runners then ran it back and forth to see where it was rubbing. With a little sanding I got it to slide nicely. 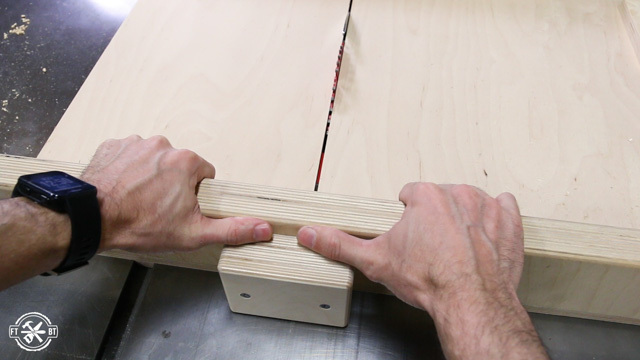 Before mounting the fences I wanted to add a handhold to the end of the table saw sled. I used a 1-½” forstner bit to establish the ends of the hand slot. 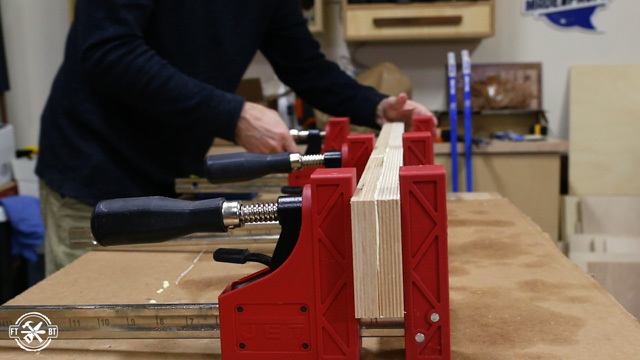 My old DIY table saw sled was bare bones and I’d just use a scrap clamped to the fence for repeated cuts. An integrated stop block makes this a lot easier, so I’ll be putting this Kreg Mini Track in the fence. 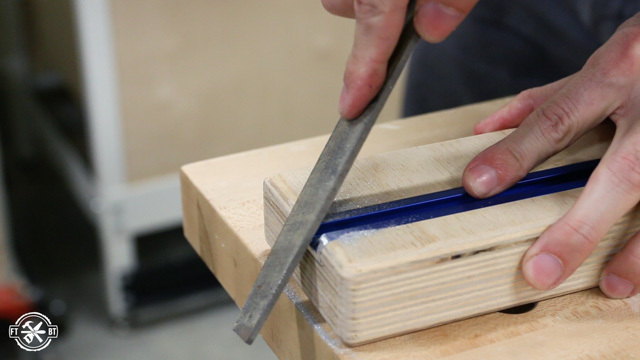 And by using some supplies from Woodcraft I’ll make my own stop block. 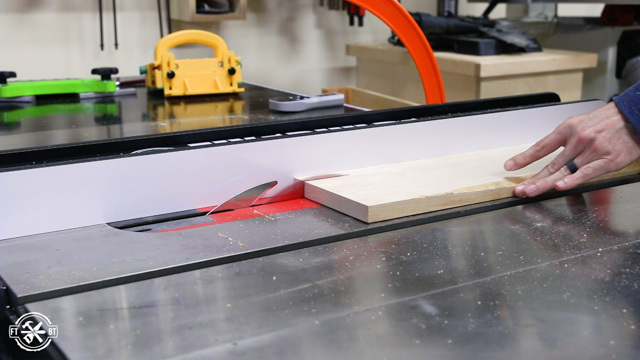 Next I took the fence to my router table and made marks where the track would stop on either side of the blade. I used blue tape to help with tearout. Instead of running the track all the way across the back, I’m going to leave a 2” space where the blade will come through the fence. I marked the width of the cut then lined it up and made my first pass. 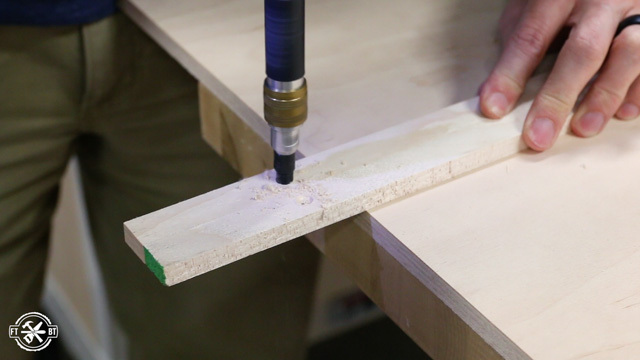 When the stop marks lined up with the router fence (which I’d set to the width of the router bit) then I knew to stop. To cut the back side I made a plunge cut, came back to the line then plowed out the rest. After that I moved the router fence back to get my full width groove and repeated the process. It worked perfectly and the track fit right in. I finished it up by squaring up the end of each slot with a chisel for a nice clean look. 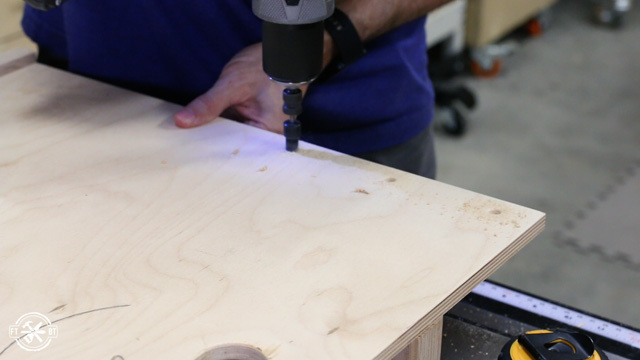 While I was at the router table I added an ⅛” by ⅛” recess to the bottom of the back fence. 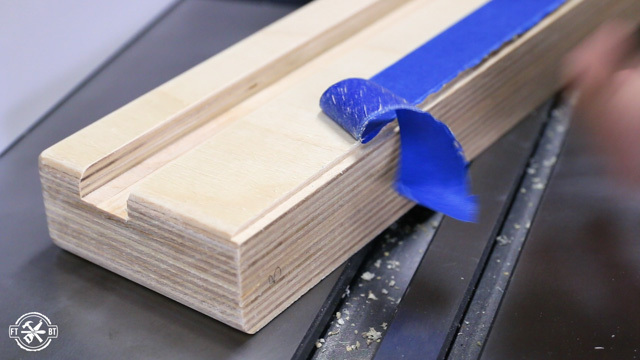 This will give the sawdust a place to go so it doesn’t build up between the workpiece and your fence and throw off your cuts. I cut the Kreg Mini Trak to size on my miter saw to fit each side. Then I test fit the track and rounded over the edges on each end with a file to keep them from catching on anything. 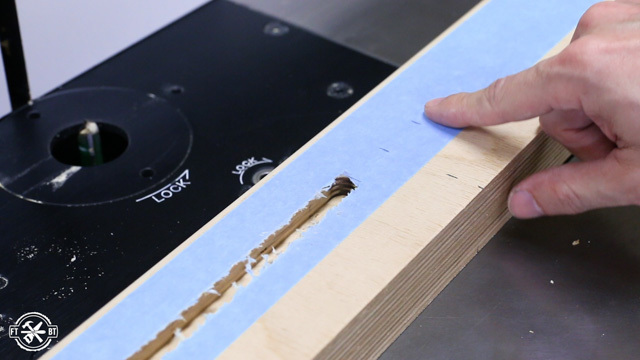 You could also just use multiple passes on the table saw to make a groove the length of the fence. If you don’t have a saw with a blade brake this is a much quicker option. At this point I start putting the fences on the table saw sled. The front fence is basically to just hold the sled together once it’s cut. I lined up the fence on the far edge then I predrilled and attached the fence with 1-½” screws. Next I raised the blade up and cut through the front fence and base until about 3” from the back. 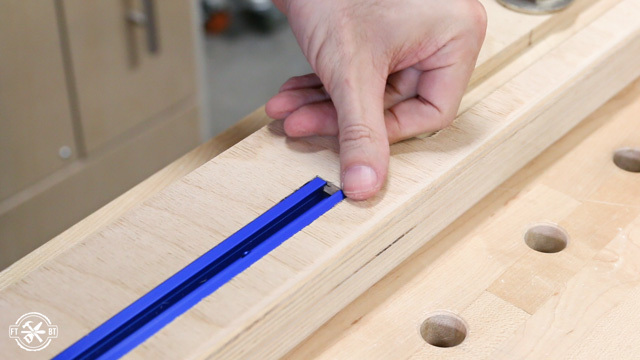 I’ll use this cut line to set the back fence of the table saw sled. 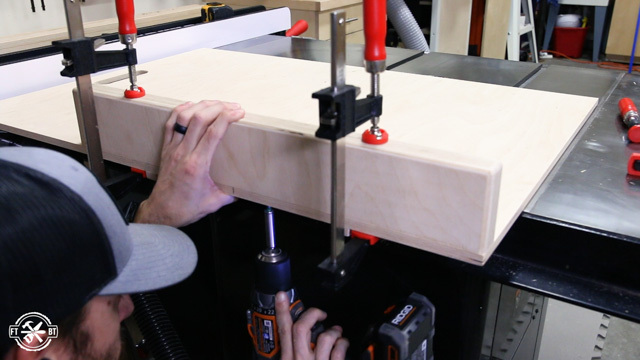 I flipped the crosscut sled over and used my countersink bit to drill holes along the back edge. I made an extra one at the end which I’ll use to put my first screw in before adjustments. Then I flipped it back and clamped the fence in place, squaring it to the cut line as best I could. I secured one screw on the near end and in the extra hole on the far end. To adjust the fence I’m using the William Ng 5 cut method, but simplified. 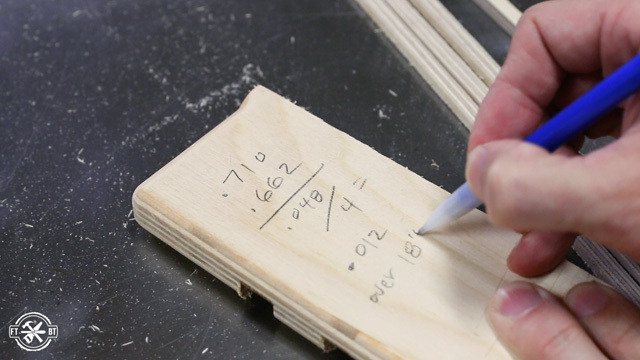 I numbered all sides of a 18 by 18 piece of plywood. Then I ripped off a small portion of each side, rotating the freshly cut side onto the fence after each cut. When I got back to the first side I made a larger strip. 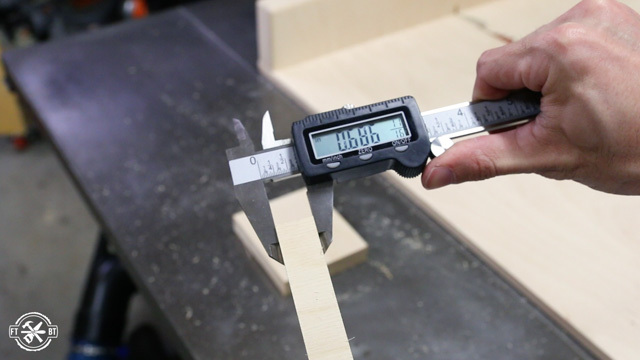 I used my calipers to measure the front and back of the strip. 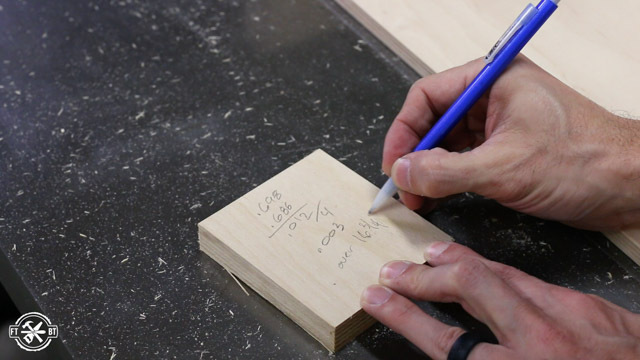 I did some math and saw I had 48 thousandths of error, but multiplied over 4 cuts. 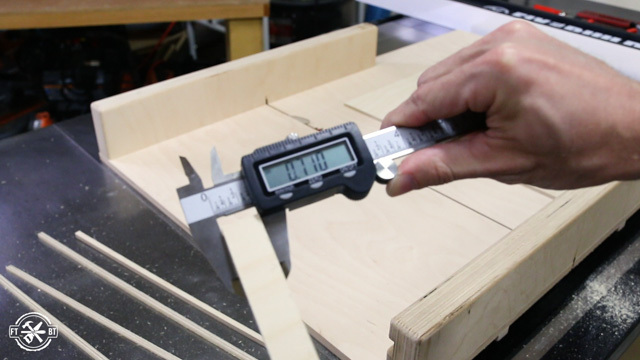 So the error over the length of my strip was only 12 thousandths. Using William Ng’s method you would do some math to get the adjustment to make at the other end of the fence. 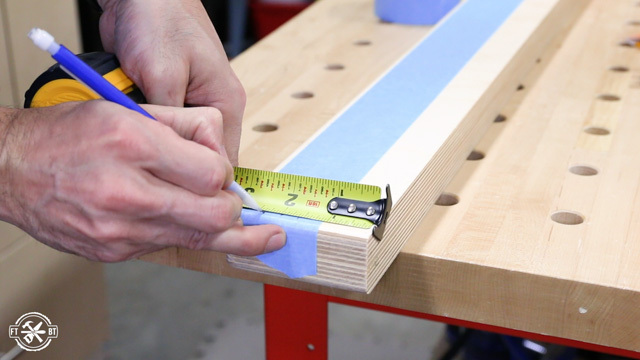 Instead I’m just going to make a 12 thou adjustment at the exact length of my strip. I made a mark where the screw was on the near side, which is my pivot point. 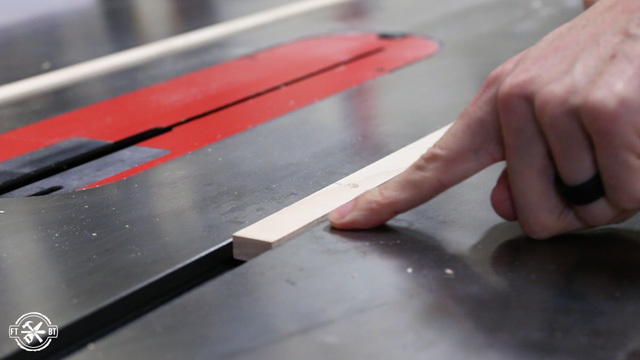 Then I put the strip on that mark and made another mark at the end of the strip for my adjustment point. My strip was thicker at the front and I cut on the right side of the blade. So to correct it I needed to move the right side of the fence backwards. 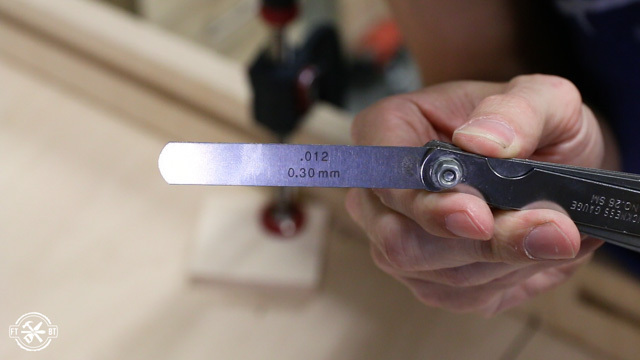 I clamped the point of a small scrap of wood against my adjustment mark. Then I removed the screw on the far side and moved the fence back. I used a 12 thousandth feeler gauge between the scrap and the fence to set the new position. Then I snugged the fence against the feeler gauge and clamped it down. 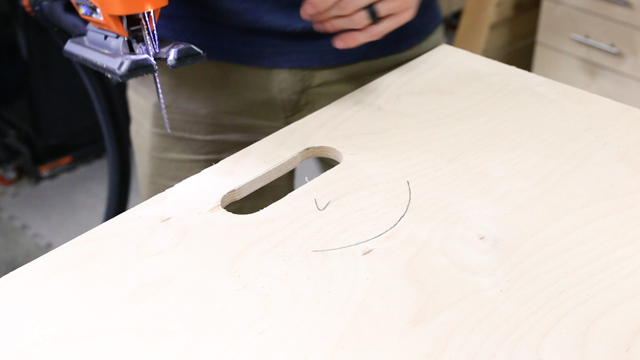 I predrilled and put a screw in one of the other countersunk holes at the end. 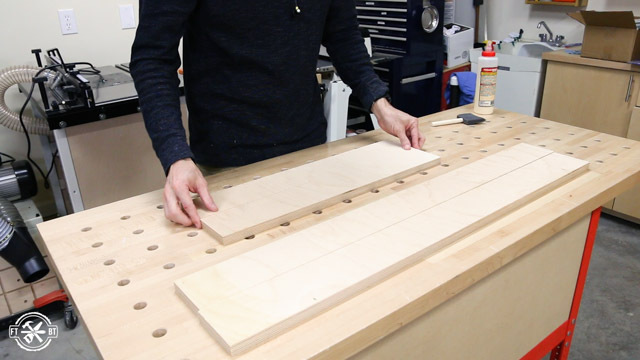 I repeated the process of the 5 cuts and took new measurements. The error was cut by about 75% and got me down to 3 thousandths over 16-¾” which is just about 8 thousandths or 1/128th over four feet. Which is plenty good for me. I clamped a level to the fence to help resist any small movements while I’m screwing it in place. Then I secured the fence in all the countersunk hole locations except my initial adjustment hole. 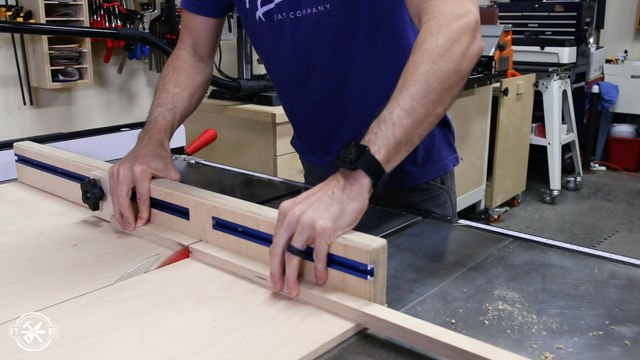 Next I grabbed my t-track, secured it in place and started making the table saw sled stop block. 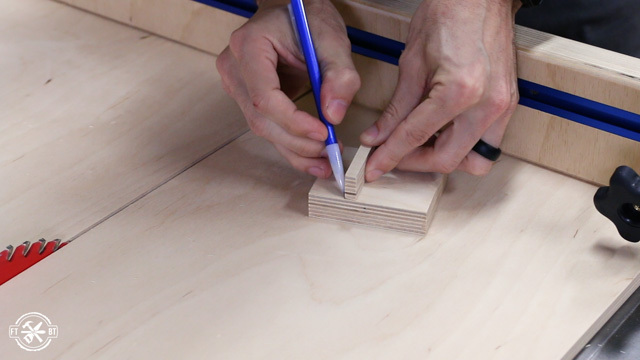 The stop block is a simple design I got from Jay Bates. It’s a small block with a spline on the back. 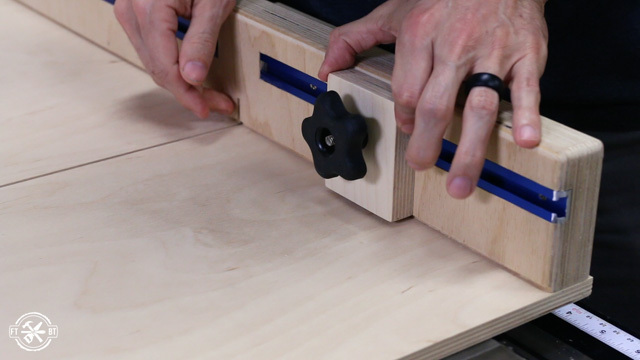 The spline will keep the block from rotating when being locked down. 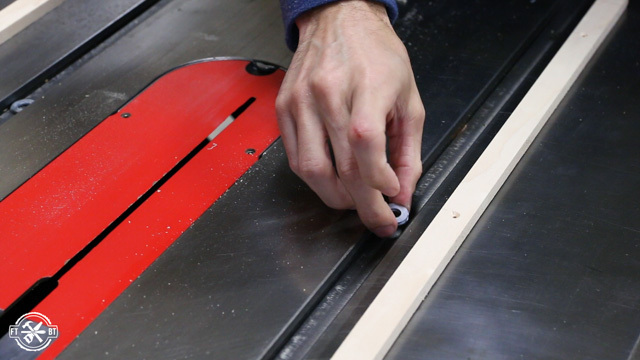 I used the sled to cut a small scrap block and a spline which I adjusted to fit the track using sandpaper. 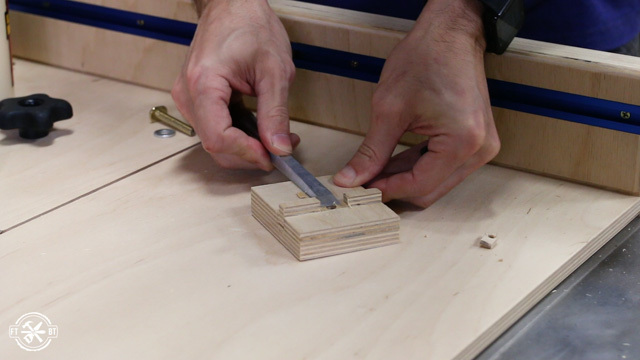 Then I marked the block for the spline cut and cut a groove for it. I made a few passes to cut the slot then glued it in place. 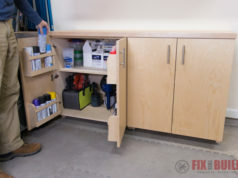 It’s a great fit with no slop and the block is ⅛” off the base to allow for sawdust to clear under it just like the fence. 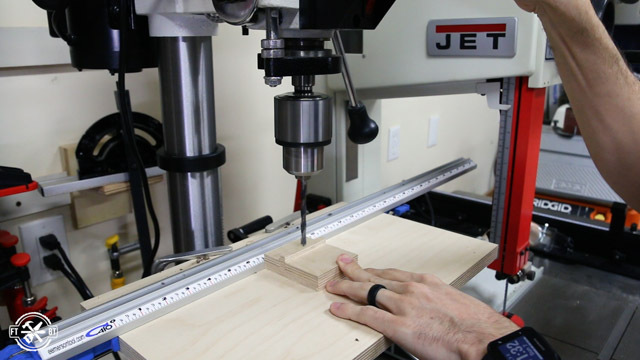 I took the stop block to the drill press and drilled a hole in the middle of the spline. I’m using the knob and t-bolt from Woodcraft. So to make room for the t-bolt I marked it on the back and chiseled it out with my WoodRiver socket chisels. 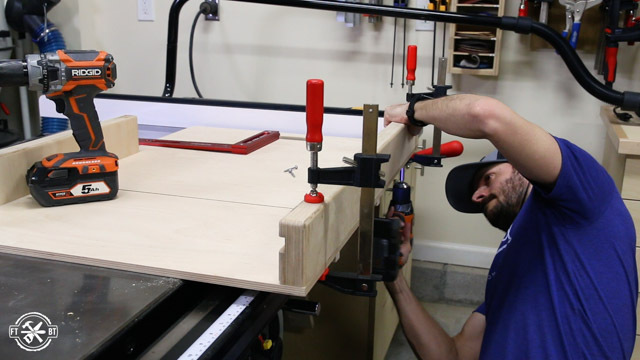 Then I just attached the stop block to the table saw sled. Finally I could make the safety feature for the sled. I cut two blocks to 4×3 inches. Then I glued them together and rounded the edges. 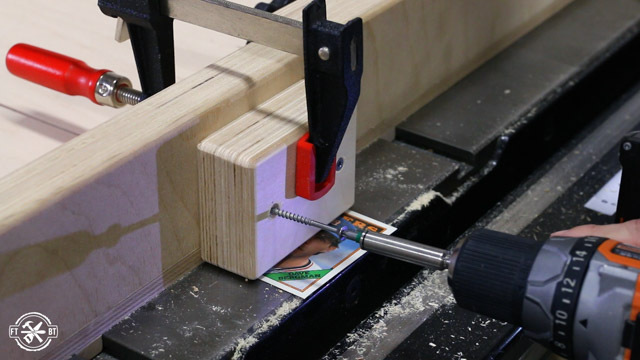 I used a baseball card as a shim, and attached the block to the back of the crosscut sled over the blade exit point. 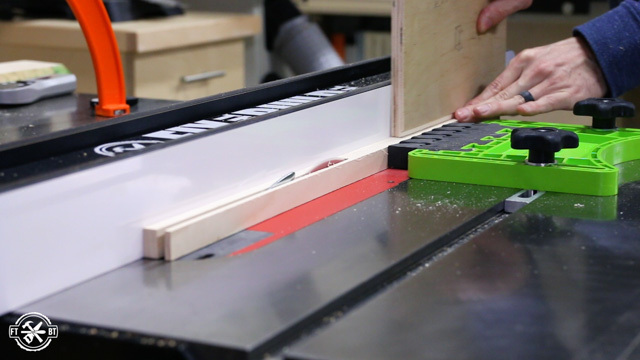 My blade can’t cut higher than the safety block on the crosscut sled. So as long as I keep my hands on top of or to the side of this block they will always be out of the way of the blade. 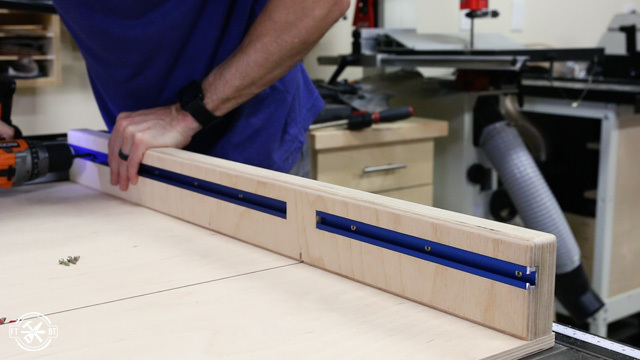 If you liked this table saw sled be sure to check out my other Shop Projects. 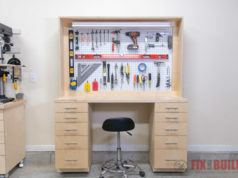 Woodcraft provided me with product and/or monetary compensation as a sponsor of this build. All opinions are my own and are not filtered by the sponsor.